Venus, 3 billion BC. Towards the end of the book, the Doctor discovers how to pilot the TARDIS to hone in on a particular person, with the help of the Venusians. On the way, the TARDIS materialises on a variety of planets. Locations include a poisonous bubbling swamp, a yellow, half-lit desert. an expanse of water covered with ice mountains and an airless place with stars (pgs 260-261). The TARDIS finally lands in the Sou(ou)shi ship (pg 272) then later just outside it (pg 277). The TARDIS later goes to some place with a machine that helps get the Venusians in and out the door (pgs 306-307). At the end of the book, the TARDIS is heading to Earth for Susan's wedding, but is first going to find Aristea of Alexandria and Barbara intends to track her mother in 1965. The title is a reference to Curse of Peladon and Monster of Peladon. The civilisation on Venus is referenced quite a bit in the Hartnell and Pertwee eras. Pg 8 Darkhig is an old friend of the Doctor; In Marco Polo, Susan states that she has seen the metal seas on Venus. Pg 10-11 The Doctor says "I always knew Susan would leave us. Ever since I first -" Ian and Barbara discuss the Doctor's locking Susan out of the TARDIS. Pg 15 Barbara lists things they've seen that no one else in their time has seen: ancient man, the Aztecs, the French Revolution, Skaro, Marinus. Pg 16 Ian wonders if the Doctor saying he would come back for Susan means that he could actually get them home any time. Pg 32 Ian likens the Venusians plans to escape to "the third planet" to the Dalek invasion of Earth. Pg 34 Barbara reasserts her identity by listing the contents of the TARDIS: hat stand, gilded clock, a strange machine that cuts and sets hair and Ian's calendar. Pg 39 Ian compares the Venusian city to other alien cities he's known: Morphoton, the Sense-Sphere and the Dalek city on Skaro. Pg 49 Barbara had to put her watch forward eleven hours for The Dalek Invasion of Earth. Pg 63 Ian tries to make Earth sound inhospitable for the Venusians and so takes his inspiration from Marinus and Skaro, describing petrified forests, deserts of brown rock and mountains of blue glass. Pg 65 Ian doubts that humanity would have progressed beyond the Tribe of Gum in 100,000BC if they too had been unable to work metal. Pg 78 Barbara wonders just how old the Doctor and Susan are. Pg 93 The Doctor uses an everlasting match. Pg 94 The Doctor says "Designed to stop Venusians, not humans," in keeping with the first Doctor referring to himself as human on occasion. Pg 108 Jellenhut sings a Venusian Lullaby, but we can understand it in English. It's not the part of the one that the Doctor sings in the Peladon stories, though. Pg 114 Barbara accuses the Doctor of treating everyone like a chess piece now that Susan has gone and the Doctor mistakenly calls her Susan in response. Pg 147 The Sou(ou)shi probe the Doctor's mind, finding long corridors of memory with sudden impossible turns, chains of thought rolling around hyper-dimensional corners and returning elsewhere, subtly altered. Pg 149 The Doctor calls the Sou(ou)shi psionic vampires and asks if they are related to the Great Vampires. Pg 157 Jellenhut sings the Venusian lullaby one last time. It's a death/endless sleep lullaby, which explains the novel's title (as the Venusians themselves are on the brink of dying). Pg 159 The Doctor reflects on Susan and David's life together: they can't have children as the species are not cross-fertile and she won't age. He wonders if she will disguise herself as someone older. In Legacy of the Daleks she does exactly this. He also wonders if she will adopt children and in both Legacy of the Daleks and the novelisation of The Five Doctors she does. Pg 160 The Doctor quotes himself from the Dalek Invasion of Earth: "You must make your own life" The Doctor considers his duty to Susan, Ian and Barbara and muses on getting old. Pg 163 Ian begin singing the lullaby as mentioned in the Peladon stories: "Close your eyes - or three of them at least -"
Pg 167 The Doctor cracks the code for a shuttle launch in record time using an 'unknown sonic device', according to the ship's on-board computer. This may or may not be the sonic screwdriver. Pg 176-177 The Doctor talks to himself in a language "ancient and subtle and complex as the geology of a world", calculating where and when he was and also simultaneously musing on the fate of the Aveletians (a previous victim race of the Sou(ou)shi's). He then tells himself to remember to carry an umbrella at all times, a reference to the seventh Doctor. Pg 181 Ian tries to remember if he could see out the back of his head when he'd been fighting the Daleks in London (as his memories return from being Venusian). Pg 242 Ian longs for one of the Doctor's everlasting matches. Pg 262 Trikobhu works out a method for piloting the TARDIS, based on tracking individuals. Pg 272 The TARDIS's Temporal Grace circuits block the Sou(ou)shi's psi tricks. Pg 273 Trikhobu's attack on the Sou(ou)shi is presumably Venusian aikido in its pure form. Pg 288 The Doctor strikes and everlasting match. Pg 301 The volcano and the destruction of the Sou(ou)shi ship mean that Venus becomes covered in atmospheric storms etc - and the Venusians survive for another hundred generations. This creates the Venus we know today. Pg 308 The TARDIS heads for Susan's wedding, which they have presumably been to by the beginning of The Rescue (as the Doctor is missing Susan), but it first going to find Aristea of Alexandria (a maker of gold). This ties in with The Book of Shadows (see page 156 of the first Decalog), where the crew are in Alexandria searching for gold to make Susan a wedding ring. There are presumably many more adventures along the way (or perhaps none, as The Book of Shadows unravels time at the end). Barbara thinks she can use the tracking technique to find her mother in January 1965. Pg 311 The Sou(ou)shi bury themselves on Earth. It's possible that they're responsible for vampire legends, or the Sentience in Nightshade (or both). Dharkhig is an old friend of the Doctor's, although he dies in the prologue. A whole race of Venusians. At the end of the book, the Doctor has some control over the TARDIS, by tracking people. Barbara intends to track her mother in 1965, which would presumably get her and Ian home. Obviously something goes wrong between the end of this book and Barbara's attempts to return home. The Doctor's calculations presumably go wrong at some point (the original calculations go wrong for the Venusian who discovered the technique, on page 306). The events at the end lead to The Book of Shadows in the first Decalog. However, time is unravelled at the end of that story, so the tracking method might have been lost in that. Venus (all over), a poisonous bubbling swamp, a yellow, half-lit desert. an expanse of water covered with ice mountains, an airless place with stars and the Sou(ou)shi ship. The Venusians and the Sou(ou)shi. Venusian culture is all through the book. Venusians have five eyes, five legs and five arms, find most metals poisonous and eat the brains of their dead relatives to remember them. They are an enlightened race and build machines out of wood for farming and travelling. They also have great thinkers and philosophers. The Sou(ou)shi have a great deal of psychic ability and are called psionic vampires by the Doctor. They appear in all sorts of forms, as they manipulate the perceptions of those they interact with. In this book they mostly appear human-ish, presumably because that's how the Venusians perceive aliens (after the Doctor and company). They can kill using psi-powers. They need your permission to kill you (and eat your mind), but they can trick you into doing it, or someone else into doing it on your behalf. IN SUMMARY - ROBERT SMITH? 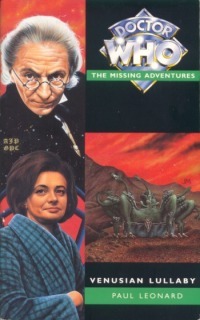 The book that effectively launched the Missing Adventures. Venusian Lullaby is astonishing for its world-building, but the actual story falls apart somewhere along the line. It's not actually bad, but Paul Leonard's debut novel proves that he can't write an ending to save his life. The Venusian names make this a lot denser than it otherwise would be, but it adds to the alienness. This really feels like exactly the sort of adventure the TARDIS crew were having all the time in the early sixties. The regulars are characterised beautifully and it's quite funny on occasions. The Sou(ou)shi aren't really developed strongly enough, but the Venusians are crafted with loving detail. In short, it's not perfect, but there's plenty here to enjoy.